HOW DO I SUBSCRIBE TO ELEVEN SPORTS? HOW DO I REGISTER TO HEAR ALL THE LATEST NEWS FOR ELEVEN SPORTS? WHAT FOOTBALL WILL I BE ABLE TO WATCH? WHERE CAN I WATCH ELEVEN SPORTS? 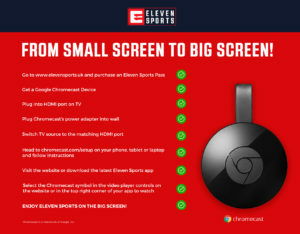 / WHAT DEVICES WILL ELEVEN SPORTS BE AVAILABLE ON? HOW DO I SET UP ELEVEN ON MY TV USING GOOGLE CHROMECAST? CAN I USE A HDMI CABLE TO CONNECT MY LAPTOP TO MY TV? WILL I BE ABLE TO WATCH ELEVEN IN A PUB OR BAR? HOW MANY FOOTBALL MATCHES WILL I HAVE ACCESS TO? WILL I BE ABLE TO WATCH EVERY MATCH OF MY TEAM? IF A MATCH IS NOT SHOWN LIVE, WILL I BE ABLE TO WATCH HIGHLIGHTS? CAN I PAUSE / REWIND LIVE CONTENT? WILL THERE BE A DELAY ON THE LIVE STREAM? WILL THE STREAM JUST KEEP BUFFERING? CAN I ACCESS CONTENT FROM OTHER ELEVEN SPORTS COUNTRIES? CAN I WATCH ELEVEN SPORTS UK CONTENT OUTSIDE THE UK? CAN I WATCH ON DIFFERENT DEVICES AT THE SAME TIME? HOW DO I CANCEL MY SUBSCRIPTION VIA THE WEBSITE? HOW DO I CANCEL MY SUBSCRIPTION VIA THE APPLE APP? HOW DO I CANCEL MY SUBSCRIPTION VIA THE ANDROID APP? HOW DO I CANCEL MY SUBSCRIPTION VIA AMAZON? Simple as that! You’re now going to be one of the first to hear about discounts, offers, what’s coming up and all the latest news from ELEVEN SPORTS! Eleven Sports will show every available game from LaLiga every match week. That is twice as many games as any other broadcaster in UK & Ireland! Fans will also get highlights, bespoke programming and unique insight into the latest LaLiga news with 24/7 access to LaLiga TV. You can also watch Eleven Sports on TV! You can do this via Eleven Sports apps for Android TV and Amazon Fire TV Stick. You can also cast to your TV through Google Chromecast. The Eleven Sports apps for Android TV and Amazon Fire TV stick can be simply downloaded from the Google Play and Amazon app stores. The state-of-the-art user interface for each app is optimised specifically for TV and the action will be available in full HD. You can do this, although this isn’t our recommended viewing experience as the screen quality may be diminished. We’re in discussions with commercial partners regarding pub and bar distribution. Head over to our fixtures page to see what’s coming up. As with all football, the fixtures are subject to change. We’ll keep our page up to date, so keep an eye on it if you want to find out when your team are playing. If there is an event coming up that you want to see live, let us know. We’re always keen to hear what the fans want to see. Register to ELEVEN SPORTS here for free to ensure that you are the first to hear news regarding what’s coming up on ELEVEN. Eleven Sports will show up to 10 LaLiga games every match week. That is twice as many games as any other broadcaster in UK & Ireland! We can’t guarantee that every match for your team will be shown live. However, if your team is not selected for live footage, highlights will be available via our on demand service. Of course! Our website and apps are full of video content including goals and highlights. You can’t record but matches that are shown live will be on demand – in full – for at least 48 hours after the match. You can access these matches by clicking on Football, selecting your league of choice under ‘Football’, and going to Replays. The ELEVEN SPORTS platform will feature adaptive playback which dynamically adjusts the quality of the video stream you receive based on the speed of your connection. Clever, huh? If your connection speed fluctuates (many factors can contribute to this such as network congestion during peak times and other devices sharing your connection), ELEVEN SPORTS detects this and lowers the quality of the video stream to ensure you can continue viewing the content without interruption. As with all online streaming, there will be a short delay on our live output. There are many factors that affect the delay and while this is normal for the time being, innovation in online streaming is continuing to reduce the delay. The content available in each country varies in accordance with the broadcast rights we hold there, and you will only be able to use ELEVEN SPORTS in the country where you have purchased your subscription. So that means, if you subscribe to ELEVEN SPORTS UK & Ireland, you can’t watch what is on ELEVEN SPORTS Belgium or Poland for example. Sorry! We do enable portability around the EU. This means that if you’re based in the UK and purchase ELEVEN SPORTS UK, you can watch that content within the EU. Football will always be a fingertip away, even if you’re on holiday! One thing we can promise you is that when you subscribe to ELEVEN SPORTS, you are only buying sports content. We won’t try and sell you Broadband or a mobile phone contract; we’re all about the sport and sport only. Your ELEVEN SPORTS pass allows you to watch content on one device at a time. Our website and apps will be full of video content including goals and highlights. Although we don’t want to see you leave, you can cancel your subscription whenever you want. Head to your Account (top right of the home page). Then expand the ‘Subscription’ box. There will then be a red box enabling you to unsubscribe. This may sound silly, but please double check the spelling. Also, if you’re copy and pasting your email address, please ensure there isn’t a space at the beginning or end. This will come up as a character and therefore cause issues. If you’re still having problems, please contact our technical team on info@elevensports.uk and a member of the team in the UK will get back to you as soon as possible. Please email technical support team on info@elevensports.uk and someone from the team here in the UK will get back to you as soon as possible. It happens to the best of us. You can reset your password at the login page. This happens after five failed attempts at logging in. Please contact customer support on info@elevensports.uk who can help you. If you have any other questions, email us on info@elevensports.uk and someone from the team here in the UK will get back to you as soon as possible. If you’re logged in, we also have a Live Chat function in the bottom right hand corner where someone from the team can help almost instantly. WHAT CAN I WATCH USING WATCH TOGETHER? If it’s live on Eleven Sports 1, Eleven Sports 2 or LaLiga TV, you can use Watch Together. Keep an eye on our schedules to see if anything takes your pick. However, Watch Together is not compatible with content on demand. HOW DO I SET UP A ROOM? HOW DO I INVITE SOMEONE TO A ROOM? When creating a room, you will be presented with a link that can be copied and shared with friends and family. If you miss this link, you can also access it by clicking on any empty camera windows when you’re in the room itself. Just send them the code via any medium including text, WhatsApp, email or on social media and they can gain access! When you’re looking for the link to share access with friends, don’t just copy and paste the URL in your browser; this will not work for new users who do not currently have valid access to your room. HOW MANY PEOPLE CAN I INVITE TO A ROOM? You can have a maximum of 5 people in each room, which includes the person that set the room up. WHAT DEVICES CAN I USE WATCH TOGETHER ON? You can ONLY use Watch Together on the browsers Google Chrome and Firefox on your laptop / PC. Once other web browsers or iOS / Android devices implement the required features, your Watch Together experience will be compatible with them. We do not know when this will happen, but we will keep you posted with any news when it’s available. WHY CAN I NOT USE WATCH TOGETHER ON A WEB BROWSER ON MY IOS OR ANDROID DEVICE? Even though you may have installed Chrome or Firefox browsers on your Apple device, those browsers are built on top of Safari, which has the same limitations as on any desktop. With Watch Together rooms, we synchronise all users to the same moment in the stream – so when a goal goes in, it’s at the same time for everyone. If you are experiencing a frequent jump in the stream it may be because your Wi-Fi connection and/or device is struggling to keep pace with the other participants. You will therefore be jumped to where your friends are in the stream to ensure you are watching at the same time. We recommend shutting down other programs and making sure your device has been restarted recently to optimise performance. Also, to ensure that everyone is watching the same moment at the same time, we put a small delay in the stream that enables us to synchronise all users. We are working on improvements to reduce this delay. Try shutting down all other programs. Watch Together takes slightly more computing power than when you’re just watching on your own. For optimal performance, we recommend that your laptop/device has been restarted recently. I AM BASED OUTSIDE THE UK & IRELAND; CAN I USE WATCH TOGETHER ABROAD? If you have purchased ELEVEN SPORTS whilst in the UK and Ireland, you will be able to access Watch Together anywhere within the EU. However, if you’re outside the UK and want to purchase ELEVEN SPORTS to access Watch Together, you won’t be able to. MY FRIEND IS ON HOLIDAY IN THE EU, CAN THEY LOGIN AND USE WATCH TOGETHER? Yes. If they have purchased a pass to ELEVEN while they were in the UK, you can watch with them. I CANNOT JOIN THE ROOM I HAVE BEEN INVITED TO. IT SAYS I DO NOT HAVE ACCESS. Check that your firewall/network connection is not blocking the connection (this is most likely to occur on corporate internet networks). We recommend all users wear headphones to get the best audio quality. If you cannot use headphones, we recommend reducing the volume of your audio or muting it entirely to optimise the experience for everyone in the room. Someone’s connection to the room has been frozen or been interrupted. This can usually be resolved by the interrupted user refreshing their screen. If the problem continues to reoccur, it is likely that the user is connecting from a restricted network that may be causing their connection to you to drop. Some devices automatically adjust your microphone input volume based on a variety of factors. This can usually be solved by accessing the properties for your audio input device and turning the setting up. A user may mute themselves so that nobody can hear them, or you can mute them yourself. If a user mutes themselves, the microphone icon on their camera will turn yellow with a line through it. If you mute them, the microphone icon will turn red with a line through. WHY CAN I NOT USE CHROMECAST FOR WATCH TOGETHER ROOMS? Chromecast cannot cast multiple video streams at once. For the big screen experience, our current recommendation is to connect a laptop to your TV via a HDMI cable. When doing this, set your TV as the primary screen or an extended screen. Do not use the screen mirroring setting as this will affect the video performance. CAN MORE THAN ONE PERSON USE MY ELEVEN SPORTS PASS? Afraid not. Friends and Family invited to your room must all have their own subscription to ELEVEN SPORTS. © Copyright 2018 Eleven Sports. All Rights Reserved.